Did you ever hear about the time a movie studio produced a lower budget film full of young actors and a mad killer that made a fortune at the box office yet they refused to make a sequel? Well that is an urban legend. There’s not a single movie producer or studio executives who would ever say no to pushing out a sequel to a successful film. The goal is always to create a franchise. The only way these films die is not if the kids finally murder the killer, but if the kids in the audience don’t buy tickets. After the success of Urban Legend, there was no doubt that the studio would be making a follow up. But who among the survivors would they bring back. 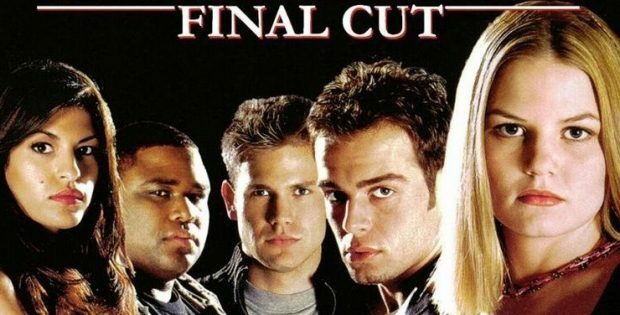 Urban Legends: Final Cut keeps the action in the school, the action shifts to a film school instead of the humanities department. The action opens mid-flight when a couple is joining the mile high club only to see a terrorist message written on the bathroom mirror. Turns out one of the flight crew is a psycho killer wiping out the crew and passengers. But the bloody chaos stops since it’s a movie set at inside a film school’s soundstage. Lisa (Jacinda Barrett from Real World London) is out at a bar with a classmate before her big plane trip. But someone slips her a mickey in her drink. She wakes up in a tub full of ice cubes and her kidney on a chair. She attempts to escape her “doctor” only to have things get worst. Back at the film school, Amy (House‘s Jennifer Goodwin) is having an issue with her thesis project. Rumor has spread she stole her script. Lacking inspiration for a new script she stumbles across the school’s campus security officer (Grey’s Anatomy‘s Loretta Devine). She tells Amy about the cover up at her old job. This inspires her to make the massacre the subject of her film. Very quickly her film goes into the red as killings plague the school. There is one death that’s explained when a classmate kills himself after disqualifying for the big Alfred Hitchcock Award. So who is getting the true final cut on this production? The biggest urban legend is that film schools are as cool as the one in the movie. These kids have sets and cameras that are way beyond the cost of kids who are starving to be able to pay for a film. Plus the fact that Amy can just come up with her thesis script right before filming is hilarious. Your average film school is loaded with washed up filmmaking faculty that won’t let you call an audible since they force you to follow the process. The film tries to make the school elite, but this place is like taking classes on the Sony lot. While there is a cameo, there are no returning students from the first film. But this allows a whole new cast to get their chance to glisten in blood. The casting agents did their job as they landed Matthew Davis (Vampire Chronicles), Eva Mendes (Training Day), Joseph Lawrence (Gimme A Break), Jessica Cauffiel (Legally Blonde), Anson Mount (Hell on Wheels) and Anthony Anderson (Black-ish). Urban Legends: Final Cut does a fine job of giving viewers more than a clone, but still exploring those classic urban legends. While the film wasn’t as successful as the first, there’s an urban legend that they made a third film that went straight to home video. The video is 2.40:1 anamorphic. The transfer allows film students to be dazzled by all the amazing toys given to the cast. Nobody seems to complain about the lights being busted or tripods missing parts. The audio is DTS-HD MA 5.1. and 2.0. You’ll hear the killer sneak up on you. The movie is subtitled. The Legend Continues: Urban Legends: Final Cut (17:04) includes interviews With Producers Gina Matthews And Michael McDonnell, Executive Producers Nick Osborne And Brad Luff, Chairman And CEO Of Phoenix Pictures Mike Medavoy, Writer Silvio Horta, And Actors Loretta Devine And Rebecca Gayheart. They recount how they put together the sequel immediately when the original’s box office returns were getting recorded. Interview With Actress Jessica Cauffiel (16:41) has her talk about playing an actress in movie. She amped up herself for when it was time to be in the student films. Audio Commentary With Director John Ottman lets him talk about how his background as a composer and editor came into play. He also points out a few of his homages to Hitchcock and other directors. Vintage Making Of Featurette (3:35) talks about the urban legends coming back at film school. Theatrical Trailer (2:23) tells you that the story will be told again. Scream Factory presents Urban Legends: Final Cut. Directed by John Ottman. Screenplay by: Paul Harris Boardman & Scott Derrickson. Starring: Jennifer Morrison, Matthew Davis, Hart Bochner, Joseph Lawrence, Anthony Anderson & Loretta Devine. Rated: Rated R. Running Time: 98 minutes. Released: November 20, 2018.